As part of my NESTA fellowship to play with electricity, I've been investigating intelligent relays as they are designed to be the simplest possible form of digital control programming. I'm generally impressed, but think it's still daunting for someone not used to programming to use the software for the first time. First choose which intelligent relay to buy. The first mistake I made was to buy a mains voltage model. It's not obvious but these will only accept mains voltage inputs. This is often a problem as most sensors are low voltage and its better to have control wiring running at low voltage. Some models will accept extension blocks for adding more inputs or outputs. Some will accept analogue inputs and produce PCW (pulse width modulated) outputs, but you won't need them for a simple first circuit. Unless you only want to do something really simple, don't try to programme the relay with the buttons on the relay itself - buy a starter kit which includes the cable and software to programme it from a PC. The friend I taught had some experience of electrical wiring, but none of logic or programming. The following notes are based my experience teaching him. 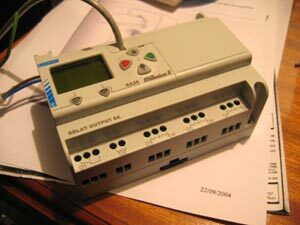 Manufacturers tend not to produce paper manuals for intelligent relays. The software disk usually has a manual in PDF form, and some contain simple worked examples to get you started. I found these useful teaching myself to use a Mitsubishi Alpha, but my friend wanted something even more basic. First connect your relay to a power supply. Connect the programming lead, usually to a PC serial port (serial to USB adaptors can be bought for laptops). Install the software. 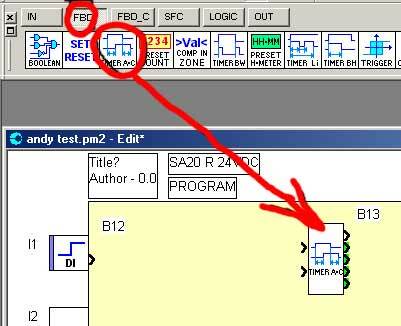 Once you've selected your model and opened a new project, you are faced with a screen full of symbols like those below. Its worth hovering the mouse over the symbols to bring up their written description - though they may not make much sense to begin with. 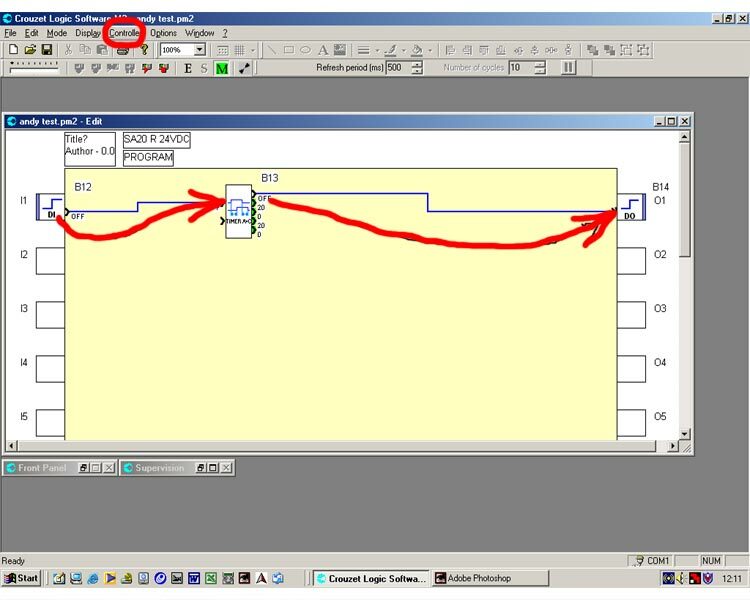 The main part of the screen is a block diagram of the relay, with the inputs down the left side and the outputs down the right. Above them is a list of symbols which represent the different INPUT options. 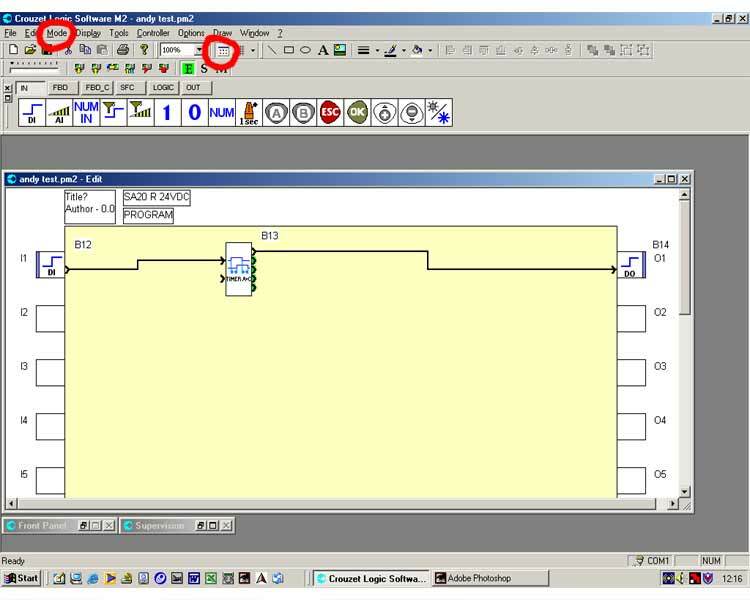 For a simple program you will only need one symbol, usually the first one, 'digital input' or something similar, and drag it into the top input box of the relay diagram. The selection of symbols intially displayed shows only the INPUT options. Find the row of buttons called FUNCTION BLOCK, LOGIC and OUT. Each of these brings up a different set of symbols. For a simple circuit you will only need one of the OUT symbols, usually the first option, called digital out. Drag this into the top right output box of the relay diagram. Connect the 'building blocks' together, simply by clicking and dragging the mouse from the input to the timer and from the timer to the output. The timer will have several inputs and outputs - just connect to the top one on each side to start with. Set the timer. With the cursor on it, double click or right click and chose 'set parameters'. This will let you set the time interval, in multiples of 100 milliseconds. Chose 'controller' from the menu list at the top of the screen, and click on 'write to the controller'. It will ask if you want to start the relay running and monitor it on the screen, say yes. Now connect a wire from the positive power in to the relay to input one. After the delay period you've set, you should hear a click and see the symbol for output one light up. 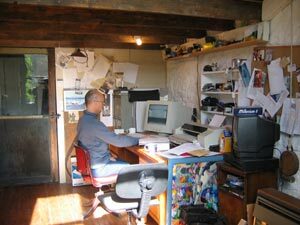 To modify the programme, select MODE from the list along the top, and then EDIT. 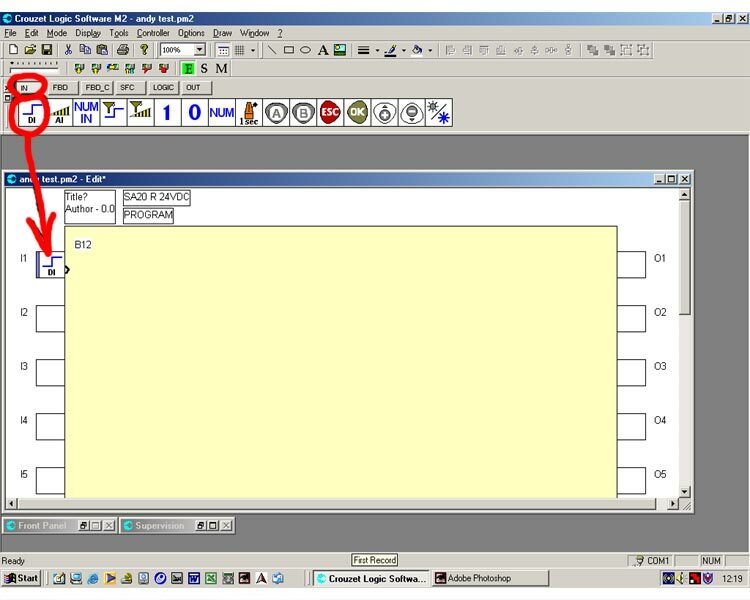 Irritatingly in the Crouzet software, the symbols do not automatically reappear, you have to press a tiny icon second line from top. Once you've got a simple program like this running successfully, its much easier to start experimenting. The HELP menu is useful for looking up the details of each symbol. Once my friend had understood the simple timer programme, it only took him a couple of hours to write the programme he actually wanted (to make a set of motors switch on and off in a timed sequence once every half hour, every day from 11am until 6pm).